The snake species in Mexico range from small, harmless garden snakes to large Boa constrictors. These types of snakes are found in varying habitats across the country, but the types that reside in the jungles are some of the most interesting (and dangerous) creatures in the world. Also known as the Crotalus durissus, the Neotropical rattlesnake can be found in a range of areas, including the jungle. It grows up to 6.2 feet long, and is venomous. A bite may cause temporary or permanent blindness, disorientation, muscle paralysis, and general aches and pains. Though it will bite when provoked, this snake feeds only on small animals, like rodents, birds and lizards. Another type of rattlesnake, the Mexican west coast rattler, also is found within the country's forested areas, as is a population of blunt-headed tree snakes that feast on a specific type of anole by way of their poisonous back fangs. Similar in appearance to a milksnake, the filetail ground snake (Sonora aemula) also is venomous, though it typically feeds only on small insects and crickets. Vipers are found across Mexico, and present danger to humans with whom they come into contact. The Jumping Pit Viper (Atropoides nummifer) is found in low elevations across southeastern Mexico. Listed as "protected" by Mexican law, these snakes reach only about 2 feet in length at maturity, but their bodies are very thick and round. The Guatemalan Pit-Viper (Bothriechis bicolor) is an extremely rare snake. Beautifully colored in shades of emerald green and blue, they can be seen during the day while resting, or at night while hunting in the trees throughout the high elevations. Eyelash palm pit vipers (Bothriechis schlegelii) are found throughout the Mexican jungles, and are seen in a variety of colors from green to silver. The Mexican cantil (Agkistrodon bilineatus) is another extremely dangerous viper found across Mexico, and it can reach over 30 inches in length with the longest fangs of any species in its genus. The Western Green Rat Snake (Senticolis triaspis intermedia) grows up to 60 inches in length, and preys on lizards, birds, and rodents by way of constriction. They prefer areas near bodies of water, and are seen in varying shades of green. 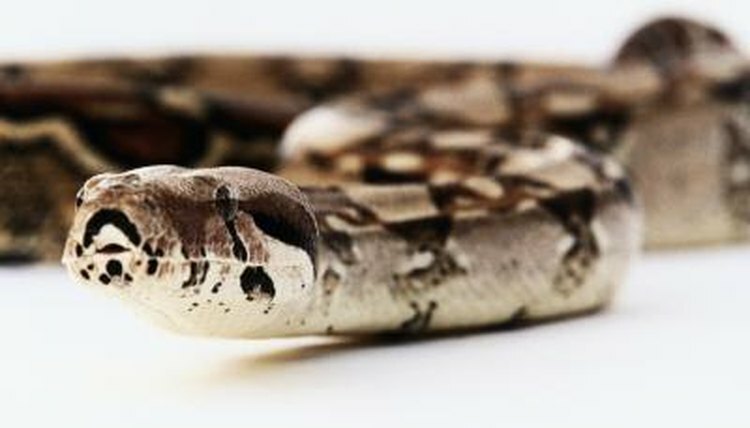 Another well known constrictor is the Boa. These snakes grow to be extremely large (up to 168 inches) and, although they tend to avoid large bodies of water, they are fantastic swimmers. Mexican kingsnakes (Lampropeltis getula nigritus) also rely on constriction to feed, and grow to be between 36 and 45 inches in length. These snakes hunt on the ground and in the trees, but present little danger to humans by way of a bite. Also known as the Brown Vine Snake, the Oxybelis aeneus is found in in the southern desert region of the United States, as well as Mexico and South America. This snake very easily camouflages itself in the trees, waiting for their prey of choice: lizards. It can reach sizes of up to 60 inches, but averages only 48, and its bite is not dangerous to humans. Most snakes of this species are no bigger around than a pencil, and their color is brown or tan with darker markings. Mexican milk snakes (Lampropeltis triangulum annulata) and blind snakes, like the Western Blind Snake (Leptotyphlops humilis), also are found in forested areas, but present very little danger or trouble to the humans who see them, and often are kept easily as pets.